Keep your head and pray. With hope. "The end of all things is near. Therefore be clear minded and self-controlled so that you can pray." I read this verse yesterday. It reminds me to keep my head, to keep praying and do both with hope and purpose. Blessed reminders with a couple of busy months on the horizon. I came across this quote at the end of March and decided to dedicate April to giving it a go. I threw the concept up onto Facebook and not too many moments later #gratefulapril was a thing. So it's been pretty quiet here because there have been daily moments of gratitude happening on Facebook instead. The gift of prayer and the gift of my prayer triplet. Schools, educational opportunities and holidays. New ministries starting up at church. Family, friends and neighbours. Specifically neighbours who intentionally planted their lemon tree right up close to our fence so that we could share their lemons. I wasn't sure about doing the daily thing on Facebook to begin with, because I didn't want it to become a month of zoning in on one thing each day. 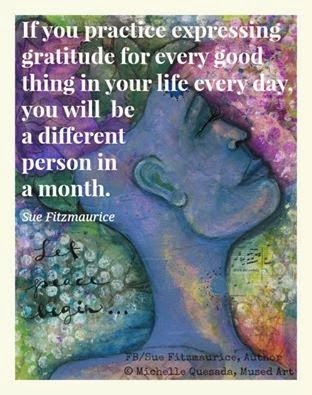 The intention was to practice gratitude continuously throughout the day. But it ended up being an excellent discipline. Many days, as I grew in my capacity for thankfulness, it was hard to choose one thing. That was a good problem to have. But as with any life in any month, some days were hard. And on those days it was good to have to dig deep and redeem God's goodness in daily life. It was such a good exercise that I have decided to keep going. Not on Facebook though. The community aspect was very encouraging, at times moving and often lots of fun however I think it would become boring and tedious for others in time and of course it led to considerable time wasting. So I'm taking away the "Face" and just recording one or two things that I'm grateful for each day in a book. On the good days I hope this practice will remind me to be grateful for ALL the good things (moreover, to give expression to that gratitude, which is the very thing that gives this quote legs) and on the harder days to be reminded that even so, we have much for which to thank God.